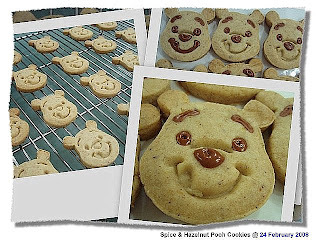 Happen to see these cute little Spice & Hazelnut Pooh Cookies from Andrea's flickr here. The moment I saw this I knew it is a must that I will put on my baking list for Reyon. And this is indeed a very nice shortbread cookies that fill with spice aroma and and nutty taste because of the ground hazelnut as one of the ingredients used. These are what we had made for our dinner and all these are Reyon's favourite sushi like Kanikama, Tamago and Kani Salad. I also made a few Gunkan Sushi(round sushi which is wrapped with seaweed and topped with ingredients) topped with Fish Floss for him. 2. Using both hands, wash rice gently for a few times till rice water becomes perfectly clear then drain. 3. Add some water and soak the rice for 30 minutes. Drain and add 250ml water and cook in the rice cookers. 4. When the rice is cooked, let it stand in rice cookers with covered lid for 15 minutes before removing the lid. 5. Transfer cooked rice into a wooden rice tub, pour prepared seasoning mixture evenly over sushi rice and stir well with wooden ladle. Use a fan to cool the rice for 5 minutes. Tamago is the Japanese omelette commonly used in maki, nigiri and tamaki sushi. Unlike a regular omelette, the tamago is made with sugar, soy sauce, and mirin added. And this is always the MUST have items when Reyon visit any Sushi restaurants, he can have about 4 in a meal. This is my very first time trying to make this at home for him. Even though I didn't managed to achieve those professional Tamago look but at least it still taste good and presentable...... For those who are interested to try out, here is the recipe that I used and also a very good youtube video that is recommended by one of my friend Pamy on how to fry the omelette @ Tamago Making (I did not use the recipe given in the video). 1. Add the eggs and the rest of the ingredients in a big bowl then beat well to make sure that it is smooth and well combined. 2. Heat up a well-oiled tamgo pan and pour about 1/4 of the mixture to the pan and swirl it as if you making crepe. 3. Cook the mixture over medium heat till almost done, fold it up to the side with a chopstick to the back of the pan. 4. Add more oil to the pan and pour in another 1/4 of the mixture, making sure to get some of it under the roll. 5. As it cook, roll the sheet and fold it up again and set it on top of the previous omelette. 6. Repeat the steps until all omelette mixture is used up. 7. Square omelette with a wooden block and remove, leave to cool. 8. Cut omelette into 7 or 8 slices then mould the sushi rice and place each slice of omelette on top and wrap it with a roasted seaweed strip and serve. a) I replace the Dashi Stock with Chicken Stock. b) The 1/4 of the egg mixture that you pour in will depend on the size of the pan as in it might be more or less. c) If you don't have the special rectage pan for making tamago, you can use any normal round pan but then trim the side when it is done. Or you can get a affordable rectangle pan at any Daiso branch for $2. 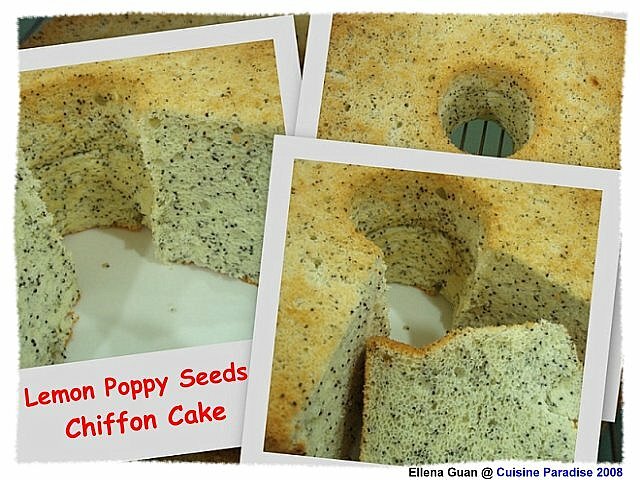 Got the inspiration to make this Lemon Poppy Seeds Chiffon Cake because a friend of mine return from Perth during Chinese New Year gave me a big bottle of the Australia Poppy Seeds. And the moment when I saw that, I knew it time for me to try out this cake again.... :P Because so far the poppy seeds that I have is from Malaysia so when I got the Australia sample, I actually look forward to bake something and try what are the different between these two. And indeed the poppy seeds from Australia actually has a stronger fragrant and taste compare to the one that I had. Hello!!! Happy New Year to all my Dear readers and friends. It had being a month or so since my last post here. As I am really busy with work and taking care of Reyon, usually I have much spare time to try out new Bakes or doing a post entry. But since Chinese New Year is around the corner, I would like to squeeze some time off to bake some goodies for my family and relatives. 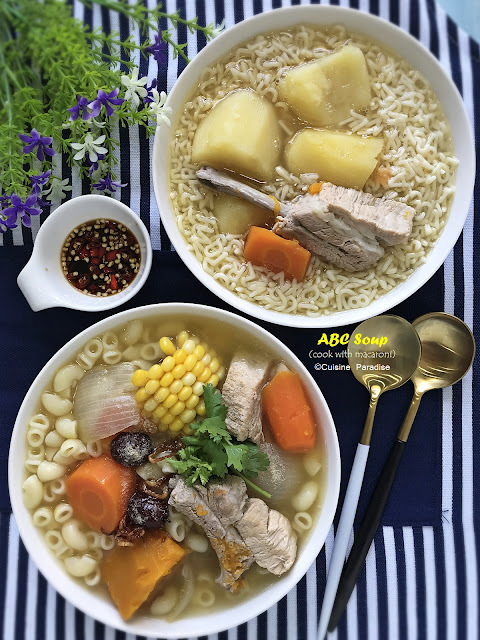 At first I guess since I didn't stock up the necessary ingredients in time I would have a hard time sourcing around for them which I might not be able to make those goodies that I plan for. But our God is good, He knows what you want and He always provide the best for us. Luckily I managed to find all the necessary ingredients just in time to make all these goodies. 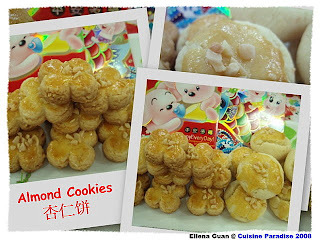 As you see, I had made 3 different types of pineapple tarts which represent 3 different good meaning for New Year. 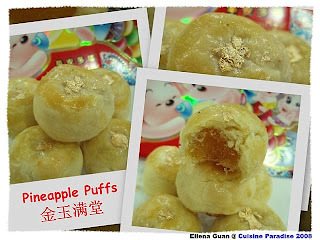 I personally prefer the pineapple puffs most because of it juicy filling and wonderful pastry and for decoration and New Year purpose I had also topped it with some edible Gold Foil to make it more delicacy. 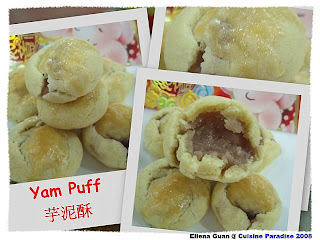 Other than pineapple puffs, I also made these Yam Puffs from the yam paste(Orr Nee) that I have. And this is really very edicting and smooth and really melts in your mouth. I love the taste of the yam paste with the pastry. And those who loves to eat Orr Nee will definely loves this special treat. This is my very first time making Almond Cookies after seeing and hearing all the good feedbacks about this Chinese New Year cookies. So since I had some ground almond left from making Macarons, I decided to give it a try. And I must confess that it really did not disappoint me. The texture, fragrant and taste are just nice like what I prefer. 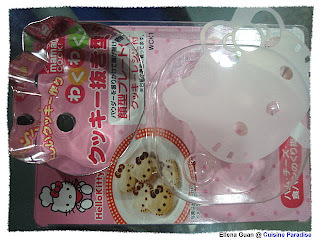 Found this interesting Kitty mould which I bought I without thinking twice. 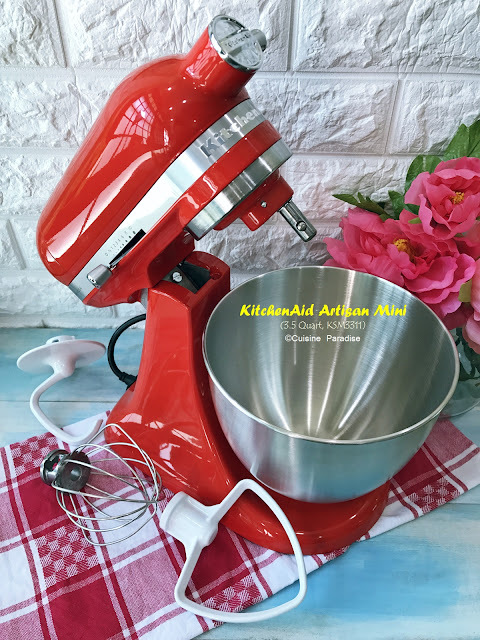 Because I knew I can used it for many different purpose like making cookies, bread or pancake that shapes and look like kitty which Reyon will loves it. 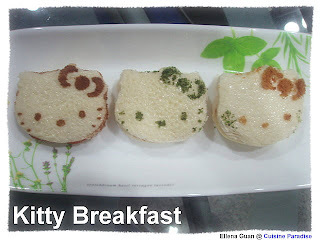 So after gather all the necessary ingredients for the Breakfast Sandwich, I decided to make these cute little kitty sandwiches for Breakfast. I guess no one will resists such a cute piece of bread as breakfast. 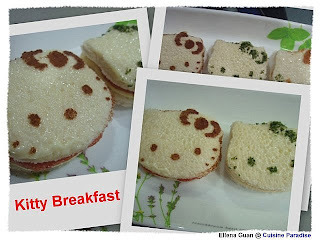 To see another version of the kitty sandwich, click on "Reyon's Kitty Breakfast"....... and if you are interested to view my collection of Kitty Utensils, click on "Hello Kitty Baking/Cooking Utensils".